@magaremoto The skin there is looking terrific! UB - thanks for the suggestions, They are very helpful. Will consider ways to draw attention to the gun and reduce its flat appearance. One way would be to darken the borders of the whole image and place a small lamp on the table, similar to Hildebrandt. Have to admit that I considered having the pinup hold the gun instead of a bullet, which would be more like the Hildebrandt image. But the key to the double meaning is really the silver bullets, not the gun. I am going to remain stubborn on another issue, which is the length of the gun barrel. The gun and bullets have the dimensions of specific gun that I modeled from references. We could go into this whole thing on the relative appeal of girth compared to length, but then I might get cudgeled by the mods. Anyway, thanks for the very constuctive criticism. Will help me make the final result much better. Vyusur - yes, I bet you recognize that G3M character. Don't worry, I will try to improve my settings and do the character justice before identifying. Thanks for the resource. Mistara - Sort of had you pegged as a Gianni renderer, but Geralt will also rock the thread. Or maybe rock the Casbah. Rock something. Magaremoto - I think I would pay money to watch a video of you and PhilW discussing lighting, surface features, and realism. Thank you so much for participating this month. Wish I had something constructive to suggest for you. On another note, my whole Carara world has just been transformed by Philemot's new GMIC plugin. If you like NPR at all, or do multipass rendering with composites, get the plugin right now. Where is the marketing team? Have to admit that I considered having the pinup hold the gun instead of a bullet, which would be more like the Hildebrandt image. But the key to the double meaning is really the silver bullets, not the gun. I am going to remain stubborn on another issue, which is the length of the gun barrel. The gun and bullets have the dimensions of specific gun that I modeled from references. We could go into this whole thing on the relative appeal of girth compared to length, but then I might get cudgeled by the mods. I won't argue specific dimensions. I'm strictly going by my sense of aesthetics. The snub nose "looks" right to me, as it fits the style and tone of the image. If it was a western image, or scfi, or zombie, I would want something different. That might be a solution! Not as elegant as holding a glinting silver bullet, but oh well. Whatever, I appreciate your patience with my input. Your idea is as clever as anything I've seen on the net. I'm hoping we will get some G3 and G8 entries, thanks to your contributions. Sorry you are not a Daz PA, otherwise I would ask you to sponsor! This is a great conversation! We actually are talking about the aesthetics of length compared to girth. As far as avoiding an anochronism, I chose the 357 in part because it was a revolver during the era of rotary phones. It was developed in the 1930s in response to gangsta' vehicles. The wikipedi page has a pic of a 1957 Colt version. The gun would be out of place in an image depicting 1870s ranchers. However, I am not a gun expert and am going completely on web information - which is often wrong. In any case, I like the 357's length because it points to our heroine. WoW!... you folks have been busy. Very great renders and ideas... keep it coming. I've taken the approach of pinups on planes... well sorta... what if this were in the future?? The people/cyborgs of the future might have a somewhat different view of pinups for their space ships. 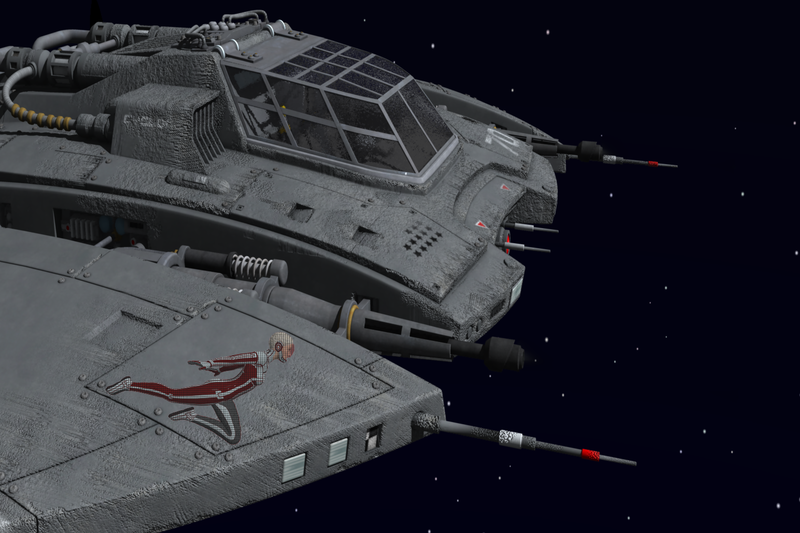 Below is what I've come up with so far... it's taken me way to long and I still have a few things to work on like the shader for the ship... it looks rather rough... it doesn't in any of the promos. Perhaps I may have camera too close. Oh... products are Starship Cyclone by petipet, Arcadia Rising by midnight_stories, Omri Hair for Genesis 2 Female(s) by AprilYSH and StarBright by DCG. Very clever, John. Hope your PT is going well. Nice to see you getting some Carrara time. John - that's looking good! 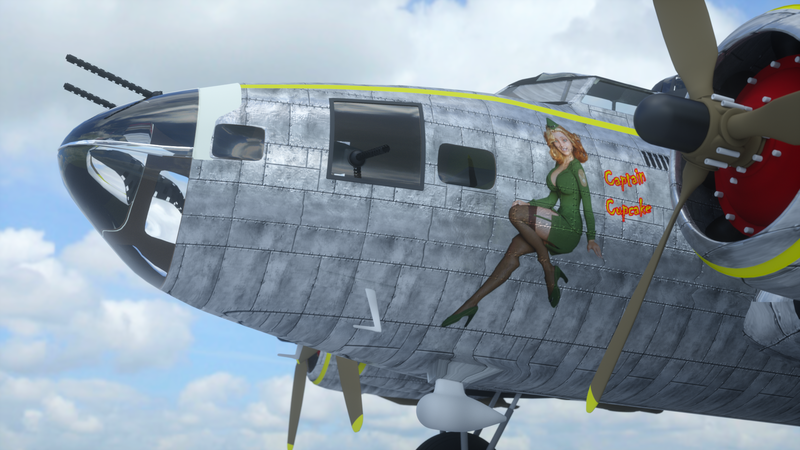 Here is my almost finished version - improved texturing on the main body and added the pin-up plus wording and a few bomb indicators that they used to show how many raids this plane had taken part in. I might change the angle a little, plus there is some postwork to be done - a bit of dirtying up, and it looks like the UV mapping goes slightly astray on the fuselage and it might be easier to fix in post than with the model (if that is allowable). So having done the pinup logo, I have now found a free model of a Flying Fortress B-17E (ideally I wanted the F model, but couldn't find a free one!). Started to retexture it, more or less got the camera where I want it and found a nice sky HDRI. So it's coming along. Need to complete texturing and add the pinup. Still rendering in Octane by the way. Congrats on finding the cool freebie! Definitely going to look great when you're done! A while back I was looking for something enirely different when I happened upon Cybertenko's gorgeous "Old Dakota" (Douglas DC3) airplane figure... I couldn't get it out of my mind. A story started developing around it. I went in and bought it - then went back for "Dakota Crashed" for the plane-crash wreckage version of the same plane, which is outstanding. I don't make a habit of buying aircraft, but this one was certainly money well spent to me. Love this thing! Wow! Turn the page to find this! Nice! Very freaking nice!!! Everyone... very cool stuff! Well... accept mine. I like it less and less. Probably try a different take on her. Yup! Misty's job = Geralt pinups! I've taken the approach of pinups on planes... well sorta... what if this were in the future?? The people/cyborgs of the future might have someone of a different view of pinups for their space ships. I have another idea for the scene, but it will be more challenging to pose. Have the heroine cradle the phone to her ear with her shoulder (head slightly cocked in a cute pose). This will free both hands. She will now be holding the gun with one hand (probably her right hand), and loading a bullet in the chamber with the other hand. The bullet can now glint anywhere, because we now know it is a bullet. The box of silver bullets sits prominently on the table, tying the whole thing together. Hmm. I'm getting obsessed with this. I've taken the approach of pinups on planes... well sorta... what if this were in the future?? Excellent John! I was hoping that someone would take the airplane pinup idea beyond WW2. Past, present, and future, it's all fair game. For the past, you could have Icarus flying too close to the sun, with a pinup on his wings. If some of you folks are having a hard time figuring out what to render, you must not be trying. I'll have a gal in a "future situation" coming soon. makes me gotta think even deeper! Sensational! I like those bomb indicators. Can you add more and display them more prominently? I attached a pic. Some WW2 bombers also used small swastikas to indicate enemy kills. 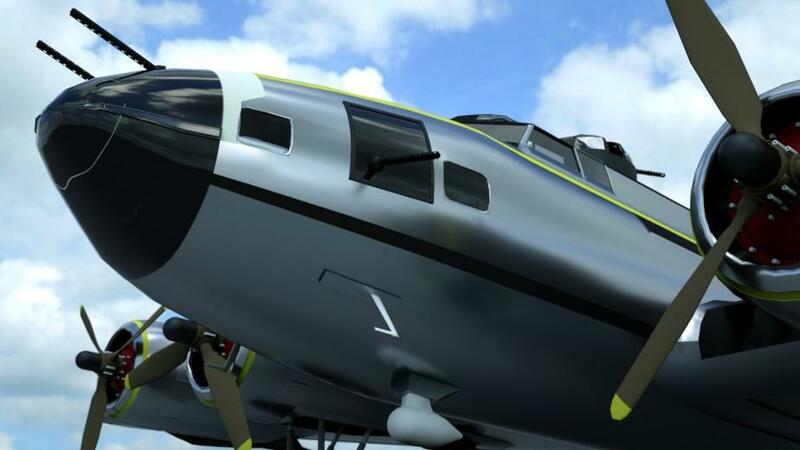 Probably a dumb question, but would displacement make the plane's texture pop any more? This is just so cool. Thanks Phil, Dart and UB. Thanks, PT is going well... I've finally started practicing with a cane but have a ways to go yet before being confident. Artists and models. Have an idea to have a cave man painting a pinup of a cavewoman model. His WIP would be a very stylized stick figure. Other cave paintings of deer etc. on wall. Just as a proof of concept, I surfed the web and found some pics of genuine cave paintings. Used two terrains to create the cave. Used the layers list to put part of the actual cave painting on my terrain cave. Inserted some figures. Here are (a) the NPR shadow brush and (b) a GMIC plugin. Jon - I exported a template from Carrara of the plane's UV map (it didn't come with any textures, just different colors for some parts). I created a metal plates texture from a pre-existing texture that I had that was close but not quite right, then used that as a pattern to fill the template (on a different layer). I also modified the metal plates to create a bump version, emphasising the rivits, and created another layer for that. I then placing the pinup using the template as a guide, I needed to shorten her leg as that was getting stretched under the fuselage. Added the text and the bomb indicators, all on separate layers so that I can adjust things later when doing test renders. 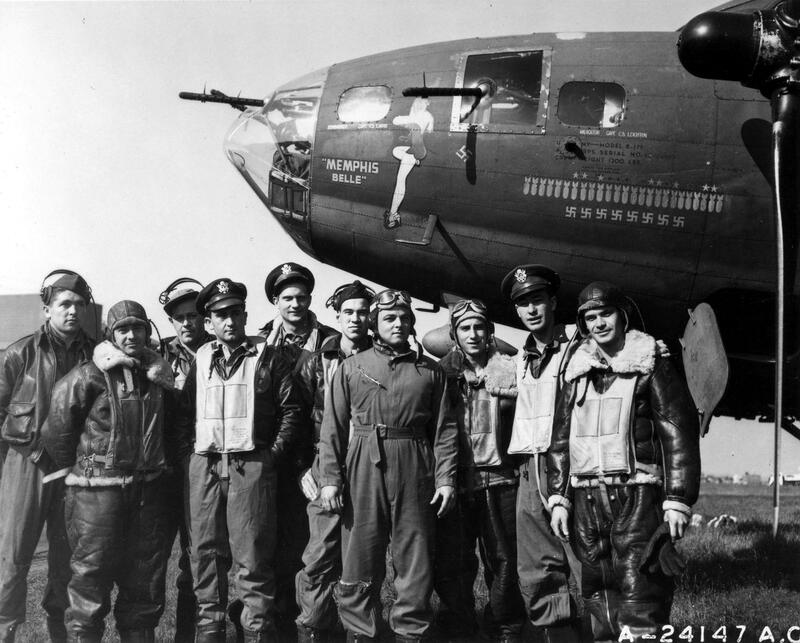 UB - I might be wrong on this but I think bombers typically used a bomb symbol for the number of successful ops that it had been on, and it was fighters that used swastikas or some other symbol to indicate the number of kills. But I can check! Bombs indicate the number of missions, and swastikas indicate the number of "confirmed" enemy fighters shot down. But the latter was hard to verify. I get to visit those warbirds when I go to EAA Fly-In in Oshkosh, just a couple hours from my house. I was really bummed to miss it this year - the Blue Angels were there. I love those guys. Last time I went, a couple years ago, I spoke to a pilot/owner of a war jet, which he flies in each year. Beautifully kept up, the jet costs him thousands of dollars in fuel just to make it to the show. Then, when he fires of the after-burners during his flight show, there goes another sevral hundred dollars! He says it's all worth it though! I love getting the chance to talk with some of these veterans at these shows. Stand around by a B52 and you'll run into some who've actually been up in one during the war. Amazing craft, they are. Seems so surreal to actually peer inside. OK, a "Timing is Everything" announcement. There are no "specific" Carrara requirements (such as lighting, modeling, or hair) in this Challenge, but I propose adding one. If you enter less than three categories, this requirement does not apply to you (unless you simply want to have fun exploring). Thank you Philemo, for your outstanding work! If this additional requirement causes anyone difficulty, please PM me. I will add this requirement to the rules at the top, and remind you of the rule periodically in the current thread. Not really working on my scenes yet, but instead have been rendering tons of bald vickies to nail down a skin shader that might be up to the challenge. Got something I'm happy with; I don't claim it's the best ever (in fact I know it isn't) but it's the best that I can do (so far) and maybe through the course of this challenge I'll learn some more tricks to get even better. BTW, almost none of this shader is my own innovation, instead it's various tips I've learned from the Carrara skin masters (Ringo, PhilW, Magremoto, DimensionTheory, Indigone, Stringtheory etc etc), which I've pieced together. It's fairly complex so I apologize for all the screenshots but I wanted to be as precise in sharing as I could, both to help others and also to solicit opinions on improvements. My theory was that a really good skin shader should work well in all types of lighting, and so I tested this one out in a lot of different lighting circumstances, though it was mostly developed using PhilW's portrait studio. Once it looked like I wanted there, I took it out into some Tim Payne and DimensionTheory Skydome and lightdome scenes, as well as some of the Carrara presets for GI and other light rigs, and even some GI inside of a Cube with 1 to 3 lights. Here's some of the test shots, and I'll follow that with the screen captures of the various shader settings.